After my blog last December about the “Old Fashioned Cocktail," I received lots of questions about why I prefer it over the Manhattan cocktail. I had to think about this a bit and, following considerable research (see below), I have changed my mind. Isn’t research great! When Scotty, one of my favorite bartenders at the Bird & Jim Restaurant in Estes Park, recently made me a Manhattan, I was reminded how smooth and flavorful a well-made Manhattan really is. It sent me right back into research mode, beginning with its history. David Wondrich's Imbibe is where I start my cocktail research, and I found there that the facts around the Manhattan's origins are a bit muddled. Of the several stories Wondrich puts forth, I like the one where a writer for the Olean (New York) Democrat, in 1882, writes, “It is but a short time ago that a mixture of whiskey, vermouth and bitters came into vogue.” The writer noted that it went under various names, but the Manhattan Cocktail seemed to be used most often. It was the first time this cocktail and its ingredients were recorded in the press. The recipes of the 1880s often called for a dash of absinthe, various types of bitters (Peruvian, Boker’s, etc. ), a dash of gum (early sweetener), and 100-proof rye or bourbon usually was prescribed. One recipe even calls for gin as the base spirit. In a mixing glass, add three or four ice cubes, the whiskey, vermouth and bitters. Stir for several seconds to blend ingredients. Next, strain the mixture into a cocktail (martini) glass. Now twist the orange peel to squeeze the oil into the glass. Throw in the peel. Finally, put in the cherry and a small amount of its juice. Here is a nice hint: After you cut your orange peel, refrigerate the orange in cling wrap—it will be good for a week’s worth of peel, and you can eat the orange at the end of the week! So, the first question that came to mind was: “Do I use rye or bourbon?” After making the drink with several different ryes and bourbons, I preferred the spiciness from the rye rather than the sweetness of bourbon. Now, I grew up in the Deep South where I learned to love sweet things, but sweet vermouth with sweet bourbon was just too much. The next question was: “What proof rye should I use?” Trying several 100-proof ryes and bourbons, like the early formulations, I could not get the balance I was looking for. The whiskeys were much bolder in the mouth and the finish was harsher and longer than I liked. I backed down to a 90 proof and hit gold. There, after playing around with several products, I decided that, of the ones I tried, Bear Creek Distillery’s rye worked best. This product, from Denver, Colorado, is a two-year old, 100% rye, with cherry, fig, and leather notes. It went very well with the vermouth I used (Dolin Rouge) and with Angostura bitters. (See more about Bear Creek Distillery in our Guidebook to Whiskey and Other Distilled Spirits in Colorado, New Mexico and Wyoming, pp. 98-99). OK, now I had a recipe I liked and the products I needed to make the drink; but I was haunted by the old timers' use of absinthe, other types of bitters (Peruvian, Boker’s, etc. ), and that dash of gum. The gum sweetener was a no-go from the start. I wanted my drink to be flavorful but not overly sweet. I tried a dash of absinthe expecting distinct licorice flavors or smell, but I got neither. When I increased the amount of absinthe to a point where it was just barely discernible, I got more 138-proof punch than I wanted in the drink. Some of the old recipes called for orange bitters. 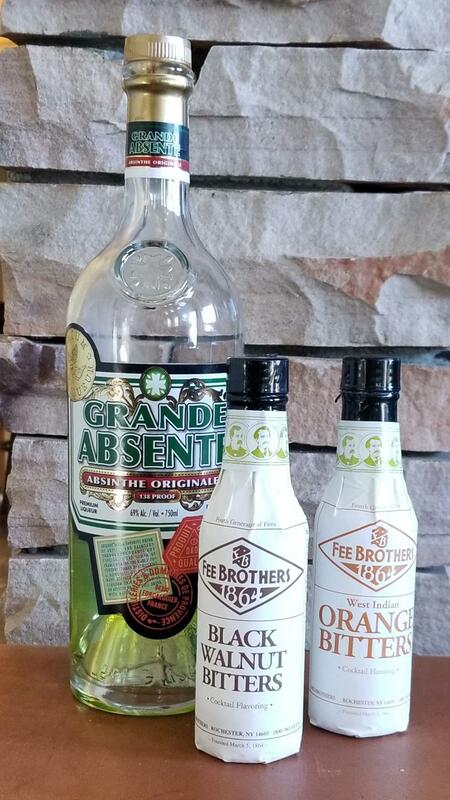 I tried Fee Brothers Orange bitters rather than the orange twist, and the twist won out by a long shot. Plus, the twist is an extra treat to feast on after finishing the drink. All the little variations in early Manhattan recipes that I tested did not, to my taste, improve on my basic recipe. However, there is one variant that I can recommend highly – substitute a good quality black walnut bitters (I used Fee Brothers) for the Angostura bitters. Unlike in the orange bitters experiment, the black walnut came through in an amazing way, for a very delicious Manhattan. My bottom line: Use the two-to-one ratio (rye to vermouth) and either Angostura or black walnut bitters, with a quality cocktail cherry and twist of orange peel—and enjoy a simple but fantastic Manhattan.